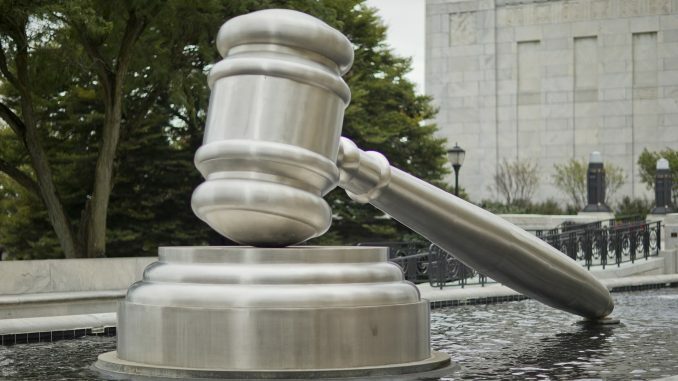 The largest judicial gavel in the world is in the form of a stainless steel sculpture located in a reflecting pool just outside the Ohio Supreme Court in beautiful downtown Columbus, Ohio. Officially known as “Gavel”, which is an obviously fitting name, the statue was created by world famous artist Andrew Scott in 2008. Gavel is one of two art installations in the courtyards next to the Supreme Court of Ohio building. The sculpture was created as a tribute to the decision-making authority of the Supreme Court. Constructed of stainless steel and concrete, The Gavel was funded by a grant from the Ohio State Bar Association. The black tiled reflecting pool, with its constantly cleaned surface that reflects the gavel and the surrounding buildings, makes a beautiful juxtaposition of things that don’t seem to belong together. The images combine to paint a picture that justice belongs both in streets and simultaneously within the halls of the building that make the laws by which we all live. The courtyard offers a tranquil space in an area of the city surrounded by relatively busy streets. The Gavel sculpture seems small in the reflecting pool but is 13 feet tall and 30 feet long. The sculpture is made of more than 7,000 pounds of stainless steel. Gavel is located in the park on the south side of the Ohio Judicial Center, 65 S. Front Street. There is another nearby fountain with words Reason, Honor, Wisdom, Justice written in steel. Andrew Scott is also responsible for The Kelpies statues in Scotland.